Is Versace Releasing Their Take On The Legendary Apple Computers Sneaker? Versace head footwear designer Salehe Bembury has led the legendary high-fashion house in a bold new direction since his appointment to the position last year. His quirky takes on high-end footwear like the Versace Chain Reaction have helped shift the luxury market in an interesting new direction. Now Bembury’s unique vision is in the headlines once again, as he recently took to his Instagram to unveil a Versace-branded take on the classic Apple Computers sneaker. 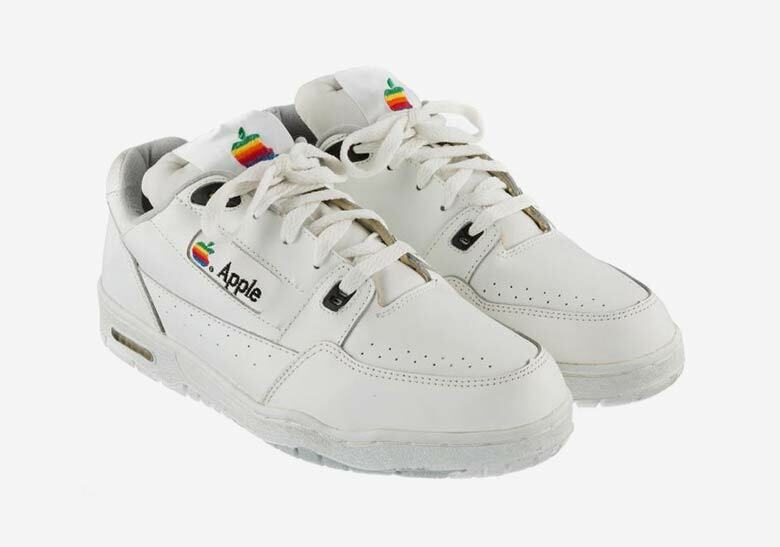 Originally produced exclusively for the tech giant’s employees in the early ’90s, the Apple shoes have taken on a life of their own as a piece of both computer — and sneaker history — and Bembury’s reimagining has left the original design almost entirely intact, making only a few small changes. Versace branding — in Apple’s font and colors, of course — replaces the standard marks on the quarter panel and tongue, and the midsole/outsole is slightly modified as well. No release/price information has been confirmed, and these special kicks may simply be a quirky one-off — but with the high fashion world’s propensity to create intentionally ironic footwear, it wouldn’t be out of the realm of possibility to imagine these luxury “computer” kicks coming to market. Get a look at both the new version above and the OG Apple shoes below, and let us know what you think of this modified classic.